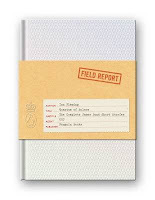 The handsome new hardcover edition of Quantum of Solace -- a complete collection of the Ian Fleming James Bond short stories -- has been short-listed for the Best Jacket/Cover Design category of the British Book Design and Production Awards 2009. A subtle diamond pattern is debossed on to the boards, which combined with deep burgundy endpapers evokes the discerning elegance of Bond’s world. An embossed manila bellyband with typewritten cover information on the label evokes the official documents of the period. The winner of each category will be announced at the British Book Design and Production Awards 2009 gala dinner to be held on Thursday 29 October at the Royal Lancaster Hotel, London. Ticket details can be found at www.britishbookawards.org, and the short-list for the 2009 awards will also be available on the website from Monday 10 August 2009.